Embrace Child Victims of Crime has launched its first ever charity single. 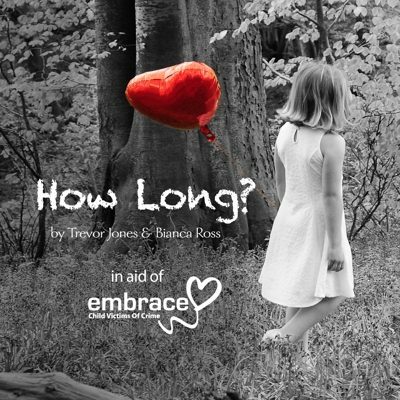 ‘How long’ is written and performed by long-term supporters of Embrace Jones & Ross, musicians Trevor Jones and Bianca Ross. It tells the story of how hope springs when you have someone to talk to you. Embrace Chief Executive Anne Campbell said: “How Long is an ‘ear-worm’ of a tune and really captures the struggles of the children Embrace is here to help. Trevor, a singer songwriter and music producer from Cambridgeshire, and Bianca, a singer songwriter from Australia, joined forces to write the song after meeting through their mutual friendship with Anne. Trevor, on vocals and guitar, composed and produced the number, with words and vocals from Bianca. “With the work of Embrace, incredible children can become survivors, and, despite what they have endured, learn to strive and thrive in their young lives. As Jones & Ross, we are blessed to be directly involved with the charity,” said Bianca. The song was premiered before an audience of 300 business leaders at the national conference for Embrace’s charity partner the British Association of Public Community Safety Officials (BAPCO), at the Ricoh Arena in Coventry on 12 March. BAPCO has announced a two year partnership with Embrace and its annual gala dinner saw members entertained with an after-dinner speech by Chair of Trustees Sir Paul Stephenson QPM, the unveiling of a video featuring the inspiring story of young ambassador Rhys Dickinson and the icing on the cake – a live performance of ‘How Long’. Embrace is the only national children’s charity which is solely focused on helping children and young people affected by crime to cope, recover and move on. It operates in all part of the UK, the Channel Islands and Isle of Man, and delivers a range of support including access to therapy, practical support and uplifting experiences.